Sunday’s Super Bowl is here! If you can’t decide between the Seahawks and the Broncos then you’re probably one of millions of Americans that tune in to the big game to see the commercials. The Super Bowl is the single biggest draw for advertisers all year. With a $4 million price tag for every 30 seconds, all the advertisers are going to want the biggest bang for their buck. Cheerios is making their first Super Bowl ad debut in the 48 year history of the game. This spot, entitled Gracie is a follow up starring the interracial family from this summer’s spot, discussed right here on smntks. So when General Mills finally decides to pony up the $133,000 per second for an ad on the big day, they choose to feature a family that created more controversy than any other Cheerios pitchman. What gives? What gives is that Gracie and her interracial TV Mom and Pop turn out to be good business. When Gracie first appeared in the summer, trolls tweeted out a host of hateful comments about the ad and interracial families in general. That would have been a sad end to the story, but haters weren’t the only ones that took to the web. Many more thousands of people weighed in with their support for the positive representation of interracial families. 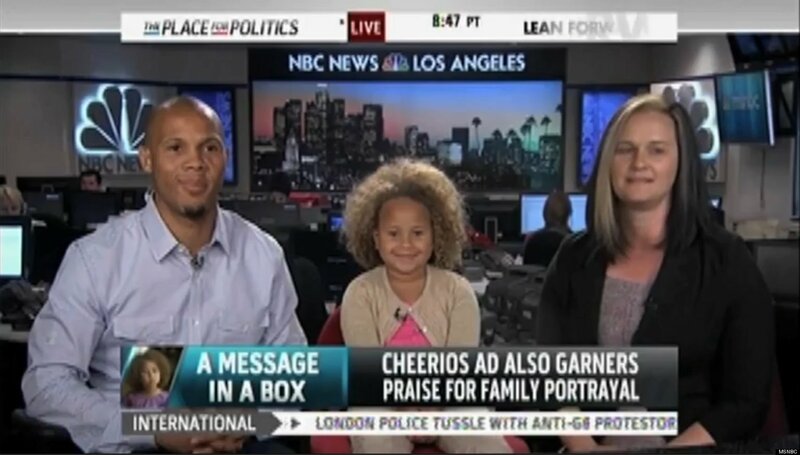 Cheerios themselves celebrates We are the 15% , a real world group formed in support of families like Gracie’s own fictitious folks. Social media and mainstream talk also weighed in to support what is increasingly a portion of the continuum of normal families in America. The moral of this story? The changing face of America has a place and space in mainstream media. Gracie’s return to the airwaves should come as no surprise to her many supporters. What is more interesting is that General Mills is willing to put 4 million cheerios front and center Super Bowl Sunday to bet on the mass appeal of a multiracial household. Running the ad on the biggest day of the year tells us that when all was said and done in the summer, customers responded positively to the representation of interracial families. Is the Gracie series racist? No. True, they are leveraging public support to improve their brand, but that’s all about green, not just black and white. So Sunday, pour out a little salsa for Cheerios’ fan favorite fam. And General Mills, since it’s working so well to show families stereotype free, maybe you could stop with the cool-ed up Nelly-Bee…or did you mean to play both sides?